Every time I watch Inside Llewyn Davis (2013), I’m reminded of the Bob Dylan song, “It Ain’t Me, Babe” and how the lyrics pertain to the film’s titular character. Set in 1961, it is the Coen brothers’ bittersweet love letter to folk music. Even though the film takes place before Dylan’s career took off, his shadow looms large because we know, in hindsight, how much he will influence the New York City Greenwich Village scene and beyond. Instead of focusing on that, the Coens decide to chronicle a week’s worth of misadventures from Llewyn’s life and how he manages to self-sabotage every potential shot at success. Partly inspired by folk singer David Von Ronk, Llewyn is brilliantly portrayed by Oscar Isaac who depicts his character as equal parts gifted musician and misanthrope. The film opens with Llewyn’s moving cover of “Hang Me, Oh Hang Me” in a small nightclub in the Village. Isaac is actually playing and singing live, delivering a soulful rendition of this song. It sets a definite tone and mood, complete with the stylized cinematography that resembles a slightly faded photograph. Llewyn’s life is a mess. His musical partner committed suicide and he’s attempting a solo career with little success. His debut record isn’t selling very well and his manager (Jerry Grayson) has no idea how to promote it or him, for that matter. Personally, he lives a transient lifestyle, crashing on the couches of various friends and ex-girlfriends, chief among them is Jean Berkey (Mulligan). 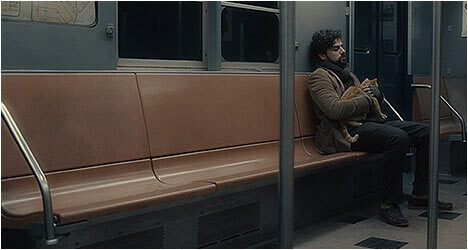 Along the way Llewyn acquires a traveling companion – a cat that he accidentally let out at a place he was staying. The musician loses the feline a couple of times but they always seem to find each other. Inside Llewyn Davis segues into a proper road movie when Llewyn shares a car ride to Chicago with an obnoxious jazz musician (Goodman) and nearly mute beat poet (Hedlund). We feel Llewyn’s pain as he spends hours enduring the jazzman’s insults and the driver’s monosyllabic responses (rivaling Peter Storemare’s equally silent type in Fargo). Their journey feels like an eternity until the poet tells a cryptic story and then recites one of his poems. Oscar Isaac is a revelation in this film, digging deep to find a way to make an unlikeable character like Llewyn watchable. The actor uncovers Llewyn’s feelings in a heartfelt scene when he visits his father who is sick. He plays a song for him that he used to like. Early on, his sister (Jeanine Serralles) hints at a contentious relationship between father and son and through song the latter tries to reconnect with the former. The stern-faced patriarch says nothing but he seems to find some kind of peace from Llewyn’s performance. It is a touching moment until the Coens punctuate it with a bit of a cruel poop joke. Despite all the poor decisions and setbacks, Llewyn soldiers on with a determination that is admirable or foolhardy. At the rate he’s going he will always be a struggling musician and mainstream success will elude him. As if to reinforce the point, the film ends with Llewyn leaving a nightclub he frequents just as a young Bob Dylan takes the stage and begins to play. He has grown tired of the daily grind of a struggling musician and the Coens refuse to romanticize it. Instead, they opt for their usual objective viewpoint that presents a world and the characters that inhabit it without judgment. As a result, they are sometimes mistakenly accused of not caring about their characters, which is not true. A lot of work went into constructing the world of Inside Llewyn Davis and the creation of a complex character as Llewyn. They are helped considerably by Davis’ wonderful performance. For every Bob Dylan that makes it big there are all kinds of Llewyn Davises that do not for various reasons. Their stories are just as interesting and worth telling as Llewyn’s. The Coen brothers approved the transfer for this edition. I couldn’t tell if it was any better than the previous incarnation released by CBS but it does represent the film very well. Fans of Inside Llewyn Davis will be happy to see that this edition is absolutely loaded with extras. First off, there is an audio commentary by critics Robert Christgau, David Hajdu, and Sean Wilentz that sees them explore the themes of the film and also put it in a literary context. They are all quite knowledgeable and this is a very informative track. “Inside Llewyn Davis” is a 43-minute documentary that goes beyond the usual puff piece making ofs to give one an excellent look into how the Coens made this film. One of the strongest extras is “The First Hundred Feet, The Last Hundred Feet,” which sees filmmaker Guillermo del Toro interview the Coen brothers. This is a career-spanning talk and it is obviously that Del Toro is massive fan of the Coens and his passion is infectious. Another memorable extra is “Another Day, Another Time,” a 100-minute concert documentary that features some of the musicians who worked on the soundtrack along with the likes of Joan Baez and Jack White, among others, paying tribute to the music. It’s great to see Oscar Isaac really singing and holding his own among seasoned musicians like Marcus Mumford. There is a conversation between music producer T Bone Burnett and the Coens about folk music, which provides insight into the authenticity of the music portrayed in Inside Llewyn Davis. “Before the Flood” is a 19-minute look at the early ‘60s Greenwich Village folk scene. Music writer and historian Elijah Wald talks about the time period and a few of the key musicians that populated the scene at the time before Bob Dylan arrived and transformed folk music into a phenomenon. “Sunday” is a 17-minute short film made in 1961 by Dan Drasin about an incident between folk musicians and police in Washington Square Park. Law enforcement prevented the musicians from attending their traditional weekend songfest and this caused quite a commotion. Finally, there are six trailers.